Sidebar: part of Donald Trump characteristics is to overly boast, and nothing gets accomplished-the Summit is a clear example. 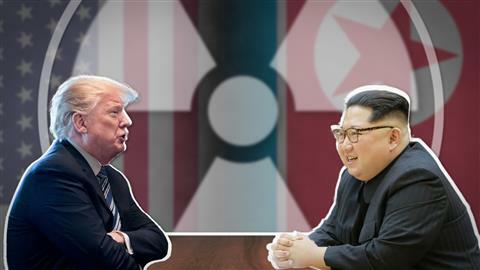 Also, according to New York Magazine, “Kim only signed a vague mutual commitment to denuclearizing the Korean peninsula – a promise North Korean leaders have made and broken multiple times.” In a normal summit where two heads of state meet, an agreement is made with concrete plans to solve a problem. However, in this case with North Korea’s nuclear weapons, there was a complete failure on Trump’s behalf to prevent Kim Jung Un from ending their nuclear developments. Recap: trade wars with China, Canada, Mexico, insults to our European allies, pulling out of the Iran Nuclear Agreement and TPP, thus far Donald Trump has illustrated how terrible he is at interational relations. As a result, the Summit held in Singapore was more about North Korea attempt of coming into the international community and fully making peace with South Korea. In addition, the summit was about the U.S. place in the world with Trump being in the oval office. It’s accurate to state, the U.S. place in the world has falling, and in the next few years, North Korea will be part of the international community. However, will Kim Jung Un, have a say in international policies and be part of the decision-making process is an occurrence the world will have to wait and see. Since Donald Trump has been in the oval office, America’s reputation has crumbled costing decades long-relationship that will take years to repair. During both the 2016 and 2017 G7 summits, Donald Trump insulted our allies, reciting inaccurate information without sources or facts to back up his claims. Furthermore, German Chancellor Angela Merkel stated in 2016, “Europe nor the world can no longer depend on the U.S.” And, Iran’s President Hassan Rouhani recently stated America does not keep its promises because Trump pulled the Iran Nuclear Deal, although Iran complied with the agreement. It should come as no surprise there was nothing accomplished at the Summit. With the on again-off again and the constant jabs back and forth between Donald Trump and Kim Jung Un, nothing being accomplished is what America and the world expected.